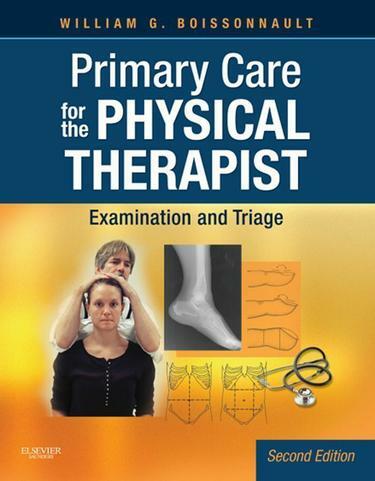 Specifically designed to address the expanding role of physical therapists in primary care, the second edition of Primary Care for the Physical Therapist: Examination and Triage provides the information you need to become an effective primary care provider. Acquire the communication and differential diagnosis skills, technical expertise, and clinical decision-making ability to meet the challenges of a changing profession with this unparalleled resource. Emphasizes communication skills vital for establishing rapport and gathering data. Patient interview guides identify what data to collect and how to use it. Overview of the physical examination lays the foundation for different diagnosis and recognition of conditions. A section on Special Populations equips the PT to handle common problems encountered in primary care. Unique approach details pharmacology and diagnostic procedures from a PT perspective for clinically relevant guidance. New information enhances your understanding of the foundations of practice and how to screen and examine the healthy population. Content is reorganized and updated to reflect the current state of PT practice. Companion Evolve resources website enables you to independently review techniques from the text. Top 10 Medical Conditions to Screen For chapter details conditions that have major significance in incidence, mortality, and morbidity all in one place. Separate chapters on upper and lower quarter screening and a new chapter on symptom investigation by symptom help you screen medical conditions more effectively.